TAMPA, Fla. (July 20, 2017)—Lynn Kroesen’s love for markets comes from her Midwest roots. Today, she serves as the manager of the year-round Ybor City Saturday Market. 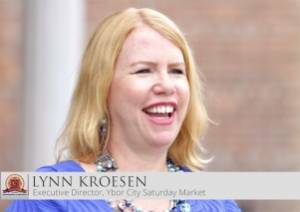 Kroesen is the newest face in the Ybor City Development Corporation’s video web series Faces of Ybor. The two-minute testimonials share inspiring stories from people who thrive in Ybor City. The series includes topics on education, redevelopment, new businesses and much more. The Ybor City Saturday Market launched in the late 1990s with about a dozen vendors. The stay-at-home mom turned entrepreneur started as a vendor herself. Today, it’s grown to more than 70 vendors. Some have even moved into brick and mortar locations. The Ybor City Saturday Market is open year-round, rain or shine. To see more videos from the series, visit www.yborcityonline.com.